Hutchinson is the largest city and county seat of Reno County, Kansas, United States, and located on the Arkansas River. It has been home to salt mines since 1887, thus its nickname of "Salt City", but locals call it "Hutch". As of the 2010 census, the city population was 42,080. The Bisonte Hotel, built in 1906 and closed in 1946. It was the Harvey House and Santa Fe Railroad station in Hutchinson. The city of Hutchinson was founded in 1871, when Indian Agent Clinton "C.C." Hutchinson contracted with the Santa Fe Railway to make a town at the railroad's crossing over the Arkansas River. The community earned the nickname "Temperance City" due to the prohibition of alcohol set by its founder. Hutchinson was incorporated as a city in August, 1872. In 1887, the Chicago, Kansas and Nebraska Railway built a main line from Herington through Hutchinson to Pratt. In 1888, this line was extended to Liberal. Later, it was extended to Tucumcari, New Mexico and El Paso, Texas. It foreclosed in 1891 and taken over by Chicago, Rock Island and Pacific Railway, which shut down in 1980 and reorganized as Oklahoma, Kansas and Texas Railroad, merged in 1988 with Missouri Pacific Railroad, merged in 1997 with Union Pacific Railroad. Most locals still refer to this railroad as the "Rock Island". In 1943, German and Italian prisoners of World War II were used in Kansas and other Midwest states as a means of solving the labor shortage caused by American men serving in the war effort. Large prisoner-of-war camps were established in Kansas: Camp Concordia, Camp Funston (at Fort Riley), Camp Phillips (at Salina under Fort Riley). Fort Riley established 12 smaller branch camps, including Hutchinson. On January 17, 2001, 143 million cubic feet (4,000,000 m3) of compressed natural gas leaked from the nearby Yaggy storage field. It sank underground, then rose to the surface through old brine, or salt wells making around 15 gas blowholes. An explosion in the downtown area at 10:45 a.m. destroyed 2 businesses and damaged 26 others. An explosion the next day in a mobile-home park took the lives of two people. The Kansas National Guard was called in to help evacuate parts of the city because of the gas leaks, and a team of specialists looked over all the city for leaks after the event. These events were broadcast on nationally televised news stations across the country. Hutchinson is located at 38°3′39″N 97°55′47″W﻿ / ﻿38.06083, -97.92972 (38.0608445, -97.9297743) at an elevation of 1,535 feet (468 m). Located in south-central Kansas at the intersection of U.S. Route 50 and Kansas Highway 96 (K-96), Hutchinson is 39 miles (63 km) northwest of Wichita, 200 mi (320 km) west-southwest of Kansas City, and 395 miles (636 km) east-southeast of Denver. The city lies on the northeast bank of the Arkansas River in the Great Bend Sand Prairie region of the Great Plains. Cow Creek, a tributary of the Arkansas, runs southeast through the city. According to the United States Census Bureau, the city has a total area of 22.75 square miles (58.92 km2), of which, 22.69 square miles (58.77 km2) is land and 0.06 square miles (0.16 km2) is water. Lying in the transition zone between North America's humid subtropical climate (Köppen Cfa) and humid continental climate (Köppen Dfa), Hutchinson experiences hot, humid summers and cold, dry winters. The average temperature for the year is 56 °F (13 °C), and the average relative humidity is 65%. Temperatures exceed 90 °F (32 °C) an average of 65 days a year and drop below 32 °F (0 °C) an average of 121 days a year. On average, Hutchinson experiences 46 rainy days a year. Snowfall averages 14.1 inches (35 cm) per year. Total precipitation averages 30.3 inches (770 mm) per year. On average, January is the coolest month, July is the warmest month, and May is the wettest month. The hottest temperature recorded in Hutchinson was 111 °F (44 °C) in 1964; the coldest temperature recorded was -19 °F (-28 °C) in 1982. As of the 2010 United States Census, there were 42,080 people, 16,981 households, and 10,352 families residing in the city. The population density was 1,854.6 inhabitants per square mile (716.1 /km2). There were 18,580 housing units at an average density of 818.9 per square mile (316.2 /km2). The racial makeup of the city was 87.9% White, 4.3% African American, 0.7% American Indian, 0.6% Asian, 3.4% from other races, and 3.2% from two or more races. Hispanics and Latinos of any race were 10.6% of the population. There were 16,981 households of which 29.3% had children under the age of 18 living with them, 44.1% were married couples living together, 12.3% had a female householder with no husband present, 4.5% had a male householder with no wife present, and 39.0% were non-families. 33.2% of all households were made up of individuals and 13.7% had someone living alone who was 65 years of age or older. The average household size was 2.31 and the average family size was 2.93. The median age in the city was 37.8 years. 23.1% of residents were under the age of 18; 10.5% were between the ages of 18 and 24; 24.4% were from 25 to 44; 25.4% were from 45 to 64; and 16.6% were 65 years of age or older. The gender makeup of the city was 50.3% male and 49.7% female. The median income for a household was $38,880, and the median income for a family was $47,336. Males had a median income of $39,442 versus $26,600 for females. The per capita income for the city was $21,050. About 12.9% of families and 15.7% of the population were below the poverty line, including 26.0% of those under age 18 and 6.9% of those age 65 or over. As of 2000 the median income for a household in the city was $32,645, and the median income for a family was $40,094. Males had a median income of $30,994 versus $21,190 for females. The per capita income for the city was $17,964. About 9.8% of families and 12.7% of the population were below the poverty line, including 16.5% of those under age 18 and 9.7% of those age 65 or over. Dillon's grocery stores was established in Hutchinson by J.S. Dillon in the 1920s (originated in Sterling, Kansas). Dillon's was bought out by The Kroger Co. in 1983. The company still operates a distribution center and headquarters for Dillons and Kwik Shop in town. The Eaton Corporation operates a hydraulics plant in Hutchinson. On August 22, 2006, Eaton announced it would keep the Hutchinson plant open because of a $1 million economic incentive from the City of Hutchinson and a $2 million incentive from the State of Kansas. 155 assembly jobs were moved to the Reynosa, Mexico plant in June 2007. On September 2, 2008, The Hutchinson Hospital changed its name to Promise Regional Medical Center. And in 2012,changed its name again to Hutchinson Regional Medical Center. Lowen Corporation was started in 1950 in a converted garage behind Mike Lowen's house in Hutchinson. Today Lowen Corporation has 2 operating divisions, Lowen Sign Company, the nation's largest manufacturer of signage for the real estate industry, and Lowen Color Graphics, the leading U.S. manufacturer of fleet, commercial, event and OEM graphics with manufacturing facilities in 3 states. StraightLine HDD, a leading directional drill tooling manufacturer, has a 70,000 sq ft (6,500 m2). manufacturing plant in Hutchinson. Hutchinson is a city of the first class with a council-manager form of government. The city council consists of five members. For purposes of representation in the council, the city is divided into four districts with one council member elected to a four-year term from each district. The fifth council member is elected at-large to a two-year term. Every year, the council selects one member to serve as mayor and another as vice-mayor. Council members are term limited and may not serve for more than one partial term plus two consecutive four-year terms. The council sets policy for the city and oversees the city manager who executes those policies. Hired by the council, the city manager serves as the city's chief administrative officer, administers the city budget, and conducts daily city business. Council meetings occur on the first and third Tuesday of each month, broadcast live on local cable channel 7. As the county seat, Hutchinson is the administrative center of Reno County. 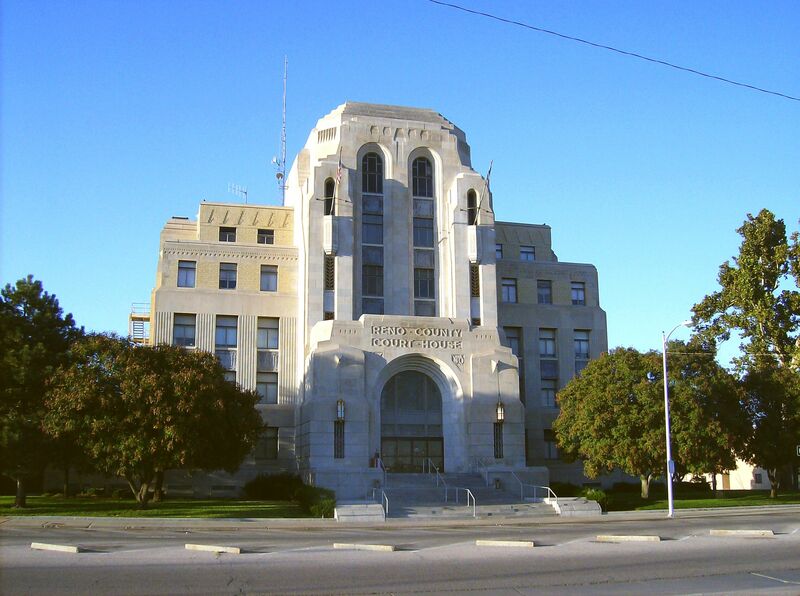 The county courthouse is located downtown, and all departments of the county government base their operations in the city. Hutchinson lies within Kansas's 1st U.S. Congressional District. For the purposes of representation in the Kansas Legislature, the city is located in the 34th district of the Kansas Senate and the 102nd, 104th, and 114th districts of the Kansas House of Representatives. The Hutchinson High School football team (the Salthawks) has had seven straight appearances, including six straight wins, in the 6A & 5A State Championship Game. In 2011-2012 school year, all Hutchinson High School athletics are 6A. USD 309 South Hutchinson operates one school just outside of Hutchinson, Reno Valley Middle School (7-8). The main campus of Hutchinson Community College, a two-year public college, is located in the city. U.S. Route 50 runs east-west south of the city. K-96 approaches Hutchinson from the south, bypasses it to the west, and then turns northwest. Coming from the west, K-61 runs concurrently with U.S. 50, turns north and runs through the eastern part of the city, and then exits to the northeast. Reno County Area Transit (RCAT) provides local public transport bus service. The agency operates three bus routes colored Red, Blue, and Yellow. Greyhound Lines offers long-distance bus service on its route through Hutchinson. It runs from Wichita to Pueblo with stops in Hutchinson, Dodge City, and Garden City. Hutchinson Municipal Airport is located on the eastern side of the city. The airport is primarily utilized for general aviation. Three railroads serve Hutchinson. One is the La Junta Subdivision of the BNSF Railway which runs east-west through the city. Amtrak uses the La Junta Subdivision to provide passenger rail service. Hutchinson is a stop on the Southwest Chief, which provides daily train service between Chicago and Los Angeles. Another railroad serving Hutchinson is the Tucumcari Line of the Union Pacific Railroad which runs northeast-southwest through the city. Lastly, Hutchinson is the terminus of two lines of the Kansas and Oklahoma Railroad: the Hutchinson Subdivision, which enters the city from the south, and the Great Bend Subdivision, which enters the city from the northwest. There are two hospitals in Hutchinson. The larger of the two, Hutchinson Regional Medical Center, is a not-for-profit general medical and surgical facility that offers a range of services including emergency care. The other hospital is Summit Surgical, a specialized corporate surgical facility. The Hutchinson News is the city's primary newspaper, published daily. Hutchinson Community College publishes a weekly student newspaper, the Collegian. Hutchinson is a center of broadcast media for south-central Kansas. One AM and 12 FM radio stations are licensed to and/or broadcast from the city. Hutchinson is also the second principal city of the Wichita-Hutchinson, Kansas television market. The market's primary CBS, MyNetworkTV, and PBS affiliates are licensed to the city, but all three stations broadcast from Wichita. Hutchinson is home to the Prairie Dunes Country Club, a golf course frequently ranked among the best golf courses in the U.S., and has hosted several United States Golf Association national championship tournaments. The club was founded by Emerson Carey and his four sons in the mid-1930s. The course was designed by Perry Maxwell, and the first nine holes opened on September 13, 1937. Twenty years later in 1957, a second 9 holes were opened, designed by Press Maxwell (Perry's son). Prairie Dunes was host of the 2002 U.S. Women's Open and 2006 U.S. Senior Open golf championships. Wait till the Sun Shines, Nellie (1952 film), directed by Henry King, is set in Hutchinson. Picnic (1955 film), directed by Joshua Logan and winner of two Academy Awards, was partially shot in Hutchinson (grain elevator scene). Mysterious Skin (2004 film), directed by Gregg Araki and based on a 1996 Scott Heim book of the same name, is set in Hutchinson. Salvation (2014 Film), Directed by Brett Donowho, Bernie Van De Yacht, was shot in Hutchinson. Dirty Jobs, Season 2 Episode 42, an episode in Hutchinson focusing on mining salt. Modern Marvels, Season 17 Episode 7, (time code: 29:40 - 34:26, first aired 12/10/2010), contained a segment on The Hutchinson Salt Mine. Rocket Power, Samuel "Squid" Dullard is said to have moved from Hutchinson to Ocean Shores, California. Sprout, a 2009 novel by Dale Peck, is set in Hutchinson and surrounding areas. Mysterious Skin, a 1996 novel by Scott Heim (adapted into a film in 2004 starring Joseph Gordon-Levitt), is set in Hutchinson and nearby towns. ^ a b c d e f Geographic Names Information System (GNIS) details for Hutchinson, Kansas; United States Geological Survey (USGS); October 13, 1978. ^ a b c d e "American FactFinder". United States Census Bureau. http://factfinder2.census.gov/faces/nav/jsf/pages/index.xhtml. Retrieved 2012-07-06. ^ Federal Writers' Project (1939). Kansas: A Guide to the Sunflower State. Works Progress Administration. pp. 200. http://books.google.com/books?id=prI_kG_QmvoC&lpg=PP1&pg=PA200#v=onepage&q&f=false. ^ Kansas State Fair history; Reno County Genealogical Society. ^ "KGS-Hutchinson Response-Gas Storage". Kgs.ku.edu. 2001-05-11. http://www.kgs.ku.edu/Hydro/Hutch/GasStorage/yaggy.html. Retrieved 2010-06-02. ^ "UPDATE ON ACTIVITIES RELATING TO GAS EXPLOSIONS IN HUTCHINSON". Archived from the original on 2006-12-15. http://web.archive.org/web/20061215175904/http://www.accesskansas.org/ksadjutantgeneral/News%20Releases/2001/01-012.htm. ^ "Kansas Natural Gas Explosion Update". Archived from the original on 2006-01-14. http://web.archive.org/web/20060114144853/http://www.fema.gov/emanagers/2001/nat020101.shtm. ^ "2003-2004 Official Transportation Map". Kansas Department of Transportation. 2003. http://www.ksdot.org/burtransplan/maps/HistoricStateMaps/2003-04Mapside.pdf. Retrieved 2014-07-25. ^ "City Distance Tool". Geobytes. http://www.geobytes.com/citydistancetool.htm. Retrieved 2014-07-25. ^ "Ecoregions of Nebraska and Kansas". Environmental Protection Agency. ftp://ftp.epa.gov/wed/ecoregions/ks/ksne_eco.pdf. Retrieved 2014-07-25. ^ "General Highway Map - Reno County, Kansas". Kansas Department of Transportation. July 2010. http://www.ksdot.org/burtransplan/maps/county-pdf/ellis.PDF. Retrieved 2014-07-25. ^ a b "Historical Weather for Hutchinson, Kansas, United States of America". Weatherbase. http://www.weatherbase.com/weather/weatherall.php3?s=72437&refer=&units=us. Retrieved 2010-07-18. ^ "Average weather for Hutchinson, KS". The Weather Channel. http://www.weather.com/outlook/health/fitness/wxclimatology/monthly/graph/USKS0283. Retrieved 2010-07-18. ^ "Emerson Carey". Skyways.lib.ks.us. http://skyways.lib.ks.us/genweb/archives/1918ks/bioc/careye.html. Retrieved 2010-06-02. ^ "Lowen Corporation Home Page". Lowen.com. http://www.lowen.com. Retrieved 2010-06-02. ^ a b "Salina". Directory of Kansas Public Officials. The League of Kansas Municipalities. http://www.lkm.org/directory/cities.php?ID=83. Retrieved 2014-07-25. ^ "City Council". City of Hutchinson, Kansas. http://www.hutchgov.com/department/?fDD=3-0. Retrieved 2014-07-25. ^ "Departments". Reno County, Kansas. http://www.renogov.org/101/Departments. Retrieved 2014-07-25. ^ "Schools". USD 308 - Hutchinson Public Schools. http://www.usd308.com/contact.php. Retrieved 2010-08-01. ^ "Buhler USD 313". Buhler USD 313. http://www.buhlerschools.org/. Retrieved 2010-08-01. ^ "Reno Valley Middle School". USD 309 - South Hutchinson. http://www.usd309ks.org/rvms/index.php. Retrieved 2010-08-01. ^ "Private Schools". Reno County 2020 Growth Coalition, Inc.. http://www.renocountygrowth.com/community_links/education/index.html#. Retrieved 2010-08-01. ^ "Hutchinson Community College". College Navigator. National Center for Education Statistics. http://nces.ed.gov/collegenavigator/?s=all&zc=67501&zd=0&of=3&id=155195#general. Retrieved 2014-07-25. ^ "Kansas Operating Division". BNSF Railway. 2005-01-01. http://www.bnsf.com/customers/pdf/maps/div_ks.pdf. Retrieved 2010-07-24. ^ "UPRR Common Line Names". Union Pacific Railroad. http://www.uprr.com/aboutup/maps/attachments/upcomnam.pdf. Retrieved 2010-07-24. ^ "Hospitals near Hutchinson, KS". Best Hospitals. U.S. News & World Report. http://health.usnews.com/best-hospitals/search?hospital_name=&city=Hutchinson%2C+KS. Retrieved 2014-07-25. ^ "Hutchinson Regional Medical Center - Stats & Services". Best Hospitals. U.S. News & World Report. http://health.usnews.com/best-hospitals/area/ks/hutchinson-regional-medical-center-6670407/details. Retrieved 2014-07-24. ^ "Summit Surgical - Stats & Services". Best Hospitals. U.S. News & World Report. http://health.usnews.com/best-hospitals/area/ks/summit-surgical-llc-6670047/details. Retrieved 2014-07-24. ^ "Hutchinson News". Mondo Times. http://www.mondotimes.com/1/world/us/16/919/2380. Retrieved 2011-12-04. ^ "Record Details - Collegian". Kansas Press Association. http://kspress.com/viewRecord.php?recid=1346. Retrieved 2013-07-19. ^ "Radio Stations in Hays, Kansas". Radio-Locator. http://www.radio-locator.com/cgi-bin/locate?select=city&city=Hutchinson&state=KS&x=0&y=0. Retrieved 2011-12-04. ^ "TV Market Maps". EchoStar Knowledge Base. http://dishuser.org/TVMarkets/. Retrieved 2011-12-04. ^ "About Us - kwch.com". KWCH. http://www.kwch.com/about/kwch-about-us,0,4740020.story. Retrieved 2011-01-09. ^ "Contact Us". KMTW. http://www.mytvwichita.com/content/about_us/contact_us/default.aspx. Retrieved 2011-01-09. ^ "Frequently Asked Questions". KPTS. http://www.kpts.org/about-faq.php. Retrieved 2011-01-09. ^ "City of Hutchinson, Kansas | Parks & Recreation". Hutchgov.com. http://www.hutchgov.com/department/index.asp?fDD=10-0. Retrieved 2010-06-02. 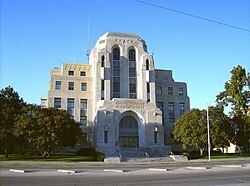 Wikivoyage has a travel guide for Hutchinson (Kansas). This page uses content from the English language Wikipedia. The original content was at Hutchinson, Kansas. The list of authors can be seen in the page history. As with this Familypedia wiki, the content of Wikipedia is available under the Creative Commons License.